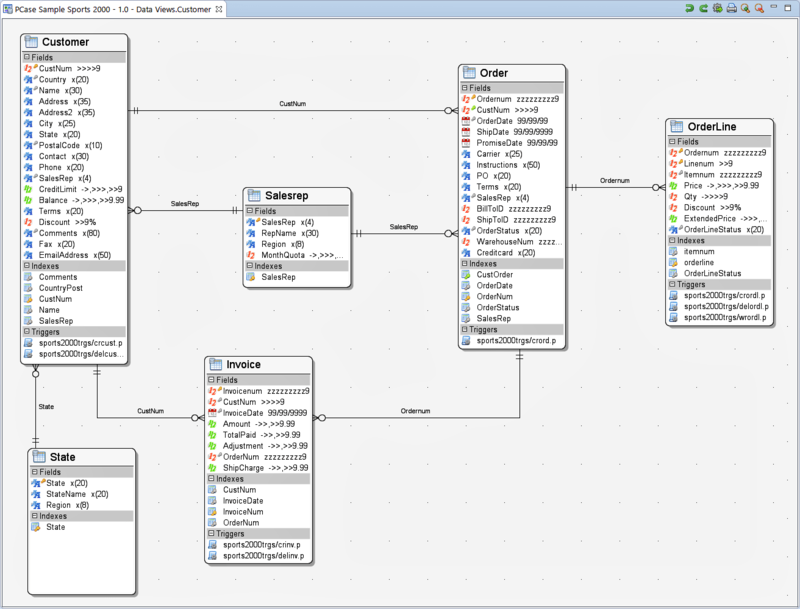 PCase is the better Data Dictionary, with DB visualization, fast access to all entities (Table, Fields, Indexes…), table relations and project meta data. PCase is fully integrated into the OpenEdge Studio. It supports the full range of DB structure administration processes in a user friendly, wizard based way. Loading schemes via DB connect or from .df file as DB model (in PCase called a project) makes an inventory of existing DBs. For new projects, PCase starts with an empty worksheet. The project can completely maintained in PCase, all physical and logical OE DB structures can be handled. Two project versions, two projects or a project and an OpenEdge DB can be compared. The changes (add, delete, change) then will be displayed in a clear tree structure. A DB structure can be updated on line. The domain concept in PCase is called linked tables and fields. A template project can hold base field types (domains) e.g. a material number with a specific format, to be used (linked) into any table using any name. Changes (e.g. format) in a domain field will be automatically updating the derived fields. The various views of PCase allow to find anything very fast in DB structures of any size. The views are linked, so when a table is marked in the schema view, it is also highlighted in the structure view and in any other open view. The property view shows the details, of what is selected, giving user full information. The schema and meta schema of a database contains very valuable information. This information can be used as a bridge between the DB and the application, in form of generated code and mappings. Customer use the macros generate: Trigger, Business Entity creation, schema export for third party products, Temp-Table and DataSet declaration, SQL DDL creation and much more. PCase has numerous level of these information which are on the OpenEdge 'physical' level (Tables, Fields, Areas…) and on 'logical' levels (Projects, Sub-views, Relations, Custom properties…). On any of these levels macros can be activated via the macro start button. These macros are OpenEdge ABL classes. During the installation various samples are written into the macro directory of the PCase plugin. These sources are the base for customer development of macro code. Click here to read an article how to set up a customer project to work with PCase macros. Modern programming often has the concept of Business Entities (BEs), where all the CRUD logic of a table or a bunch of tables is accessible via AppServer (or REST) calls. 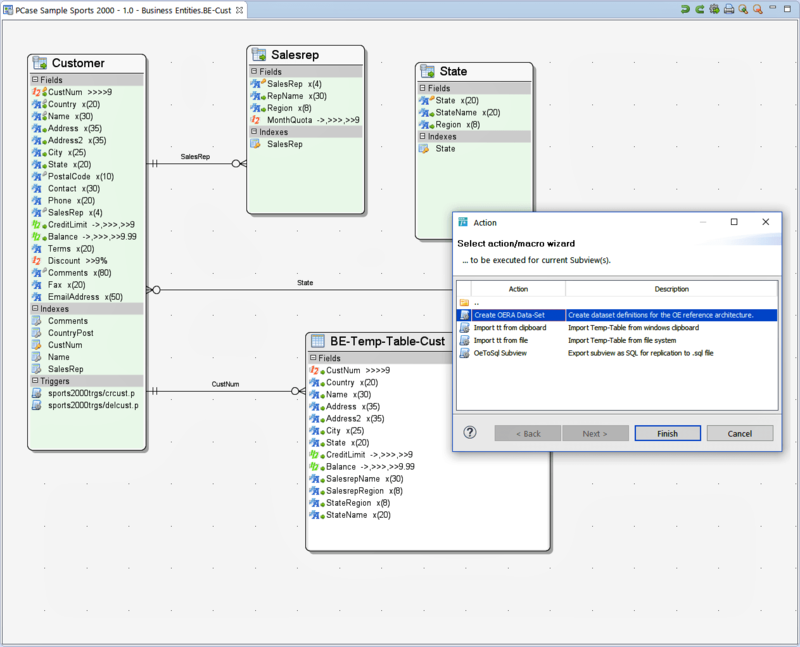 PCase supports a special diagram type for BEs, holding table buffer and temp-table definitions. The buffer fields together with free defined fields set up the temp-table structure as base for a Business-Entity. Via macros an individual kind of a Business Entity can be generated. PCase helps a lot to document the DB with tables, table relations, subviews, HTML reports… This is helpful for developers and the customer. Most databases in the OpenEdge world are mature DBs, so first goal of using PCase is often documentation. The import process put all tables in the default Sub-View, which is called "Data Dictionary". Typical OpenEdge systems in the market have 200 (CRM) to 2000 (ERP) tables. Arranging that much tables in a diagram is a futile attempt. Organizing a larger DB in PCase starts with creation of Sub-Views. Then adding table relations will show how the tables are connected. PCase allows any kind of table relations, including some irregular. to allow the representation of real world databases. Examples are different field types [e.g. charfield = intfield], value relations [e.g. cust.type = "A"] or expression relations [e.g. cust.num = int(substring(somestrangecode, 4,6))]. The DB structure could be exported as HTML report on various levels (Project, Sub-View, Business Entity). The report includes the tables, fields, descriptions and so on, it could used internally as short reference or be handed over to the customer, to satisfy the common customer demand on DB documentation. The reports could be customized via .xsl changes. There is detailed information about PCase available. This could be explored via the HowTos, YouTube videos, help file, version history and articles. Starting with PCase is simple: download, installation and then work with PCase. Even in an unregistered version of PCase most tasks can be done, and for testing purposes we offer a cost free time limited license. Help: Local installed HTML help, describing mechanisms, concepts and possibilities. The HTML help is also available online. PCase First Steps: Local installed PDF, describing installation, project setup and some basic processes (also available online.). Article: This article describes how to set up PCase and an OpenEdge project to develop macros. YouTube Channel: The videos covers concepts and tasks. They show the stand alone version of PCase, but the concept is still the same. Version History: Lists the changes in PCase from version to version. PCase is being constantly developed. You either can see the version history of PCase here or stay updated by a newsletter subscription (less than 10 letters per year). If so, then please don't hesitate to contact us. Please call +49 (0) 40 – 30 68 03 – 0 or use the contact form below.